Acacia Concinna is an ayurvedic medicinal plant found in India and its fruit is known as Shikakai. Concinna extracts are made into powders and shampoos. Powders would be dry and doesn't produce froth like shampoos. Shikakai added with henna and other dry medicinal flower powders is said to be very good for hair growth. Shikakai can be applied on skin to avoid problems such as dry skin. Other than using on hair and skin, it is used as a detergent and for polishing fish skin before it is sold. • It's low on PH, hence, very mild and acts as a detangler. Due to this property, it gives a lustrous appearance to your hair. • Shikakai leaves soaked in water and ground into paste can be used as an anti-dandruff medicine. • Shikakai can be applied as a hair pack and can be washed off after 2 hours for reaping its benefits. 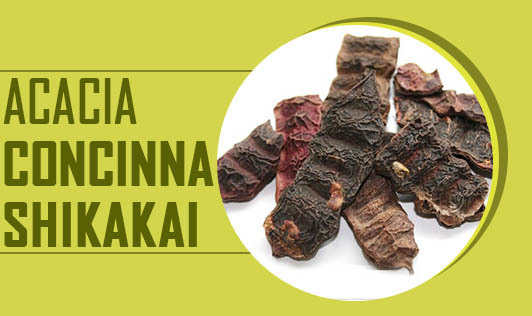 • The chemical property of Shikakai acts as a natural conditioner and gives strength to the hair and fights against early graying of hair. • Regular use of shikakai in summer will keep the body cool. Castor oil massage with the combination of Shikakai head bath promotes healthy hair growth. Use it occasionally and get its maximum benefits.